Whew, another Milwaukee Irish Fest went by in the blink of an eye for us! Big thanks to everyone who supported our show on Friday night of the festival weekend, the dancers who closed out the night with us on Saturday night at the Dance Pavilion, and all the friends and family of Glencastle Irish Dancers. For those who missed out on Milwaukee this year, here's a bit of a recap. 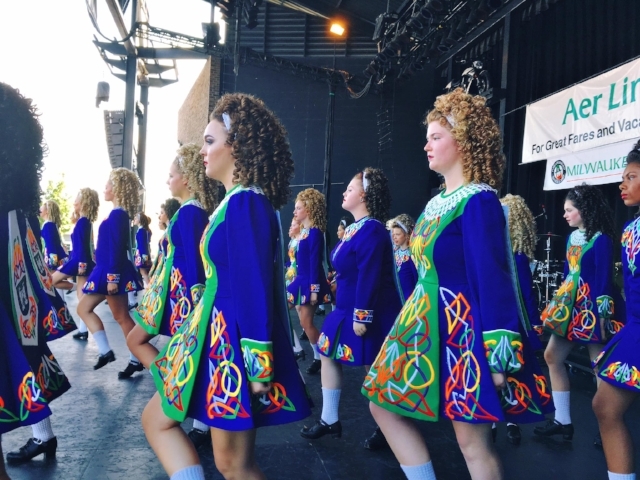 athas performing with Saoirse Irish Dance Team at 2017 Milwaukee Irish Fest. Photo by Kevin Mulvenna. Our stage show this year was on Friday night at the Village Pub stage, one our favorite spots to play at Milwaukee Irish Fest. Cole, the sound engineer at the stage, has a great ear and knows his stuff, so once he had us dialed in we knew we'd sound good! Thankfully the weather was beautiful the whole weekend, although under those stage lights it was a burner. We were very happy to be joined by Marquette University's Irish Dance Team, Saoirse, at their first Milwaukee Irish Fest performance. Back in March, we met Annabel from the team when she was dancing for the Rockford St. Patrick's Day post-parade party. It was super fun collaborating for the Fest show with Saoirse, and we're looking forward to more performances down the road! It was great seeing so many friends and family show up on Friday night, along with all the new faces watching and listening at the Village Pub. Speaking of collaborations, we continued working with the fantastic Glencastle Irish Dancers in 2017 for their performances at Irishfest La Crosse and Milwaukee. Megan and Colleen put together an amazing show this year, and we definitely had to put in some practice hours and maintain focus to keep up with the challenging and creative choreography. As always, we were blown away by the dancers' hard work, dedication, talent, and athleticism. Thanks Bridget and Glencastle for including us for the GID shows at the Aer Lingus and Tipperary stages! The athas crew got scheduled to close out the Dance Pavilion on Saturday night for a set dance ceili. We were super excited to welcome accordion maestro John Williams for the gig, and we started out that first set joined by harpist extraordinaire, Aislinn Gagliardi. To be honest, we were afraid we wouldn't have enough juice for this one -- Irish Fest week is a long one, and the dance started at 10pm! But, the dancers' energy gave us all a second wind, and the Dance Pavilion kept roaring till the end. Thank you, dancers, for all the enthusiasm and lift! Milwaukee Irish Fest School of Music Student Performance. Photo by Rae Ann Hassler. We were one again happy to support our students from the Milwaukee Irish Fest School of Music during their performances on Sunday of Milwaukee Irish Fest. All the students worked incredibly hard to prepare for their shows, and they sounded fantastic! We're proud of their hard work and dedication for keeping Irish music in Milwaukee growing. Well, that's a wrap for 2017! For more photos from our romp at Milwaukee Irish Fest, check out our Instagram feed. Also back in March, We Banjo 3 made a Green Season stop in the Milwaukee area, and fiddle Fergal Scahill recruited both Jeff and Heather for a special project. We'll be throwing up some Spotify playlists of tunes we've been checking out. For April 2017, here are five tracks from some more contemporary Irish albums by Colin Farrell, Cuig, The Bonny Men, Goitse, and Connla that we've digging. Hope you enjoy! That time we were on 88Nine's 414Live! áthas had a typically busy March in 2017, and a huge highlight for us was appearing on 88Nine's 414Live! Some of you might already know that all the áthas members also teach Irish music around the Milwaukee area. Back in 2009, a bit of serendipity during our weekly gig at Brocach put us in touch with a folk music legend. For all of you who listen to Irish music on Spotify, feel free to look us up and give us a follow! Or just listen to our albums below.